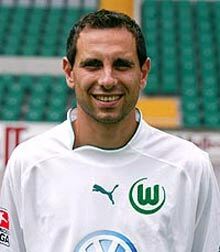 For a second day in a row the superlatives for Bulgarian striker Martin Petrov, who scored four times for Wolfsburg's Saturday victory, remained on the top pages of the German printed media. Bulgarian Petrov scored all four goals for his Wolfsburg, as they beat newcomer Mainz 4-3 to extend its lead in Germany's Bundesliga. "The fans are celebrating the newest holiday - Martin's Day", Wolfsburger Nachrichten reported. The newspaper calls the footballer "the superman Petrov" saying that the 25-year old Bulgarian overshadowed his teammates "in the biggest day of his career." The German "Kicker" magazine said: "for Wolfsburg Petrov has been the footballer with the golden shoes, now he is also the footballer with the golden left foot."